In 1999, Time Magazine proclaimed Carousel the greatest musical of the 20th century, and you’ll get no argument here. 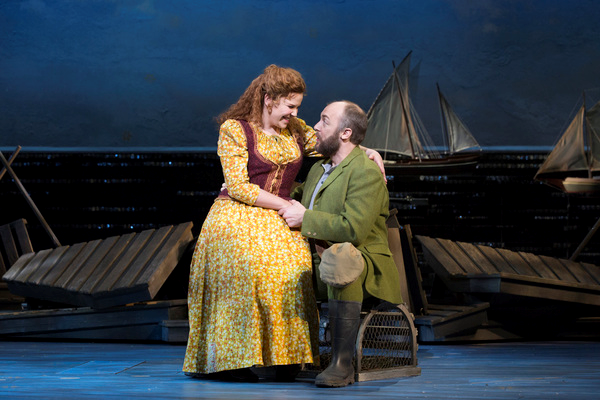 Richard Rodgers and Oscar Hammerstein II’s 1945 classic, their follow-up to Oklahoma!, expanded on the innovations of that 1943 trailblazer. Carousel dug deeper, integrating song, dance, underscoring, and text in ways the musical had never seen before; told a tragic but ultimately uplifting story with complex, troubled characters; inspired Rodgers to a soaring, eloquent score that remained his favorite among his works; and prompted Hammerstein to adapt the source material, Ferenc Molnar’s 1909 play Liliom, so skillfully that even Molnar, attending a rehearsal in New York, had to admit that he had improved it. A town with a Carousel in it is automatically a happier town, but the uninitiated should be warned that the new revival at the Imperial is a heavily revised, and hence considerably damaged, production. Director Jack O’Brien and choreographer Justin Peck have reorganized, rethought, and cut the original material, shying from some of the less pleasant truths about Carousel’s tormented couple, carnival barker Billy Bigelow (Joshua Henry) and mill worker Julie Jordan (Jessie Mueller); they’re presenting what is, in brief, a 21st century take on a 20th century classic set in the 19th century. For the most part, it’s gorgeously sung, and the physical production, with Santo Loquasto’s impressionistic sets and Brian MacDevitt’s colorful lighting, is just fine. (Ann Roth’s costumes are a bit off; who, even back then, ever wore a bright-green suit?) However. For years, Carousel has suffered something of a backlash, brought on by #MeToo and other worthy sexual-equality movements. 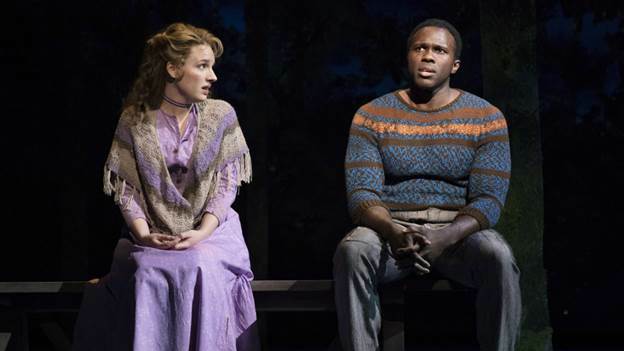 Chided in some quarters as “the wife-beating musical,” it by no means forgives Billy for hitting Julie in a low moment, but it does have her accepting her lot, recognizing that his brief abuse stems from love and frustration, and, in Hammerstein’s lyric, “he’s your feller and you love him, that’s all there is to that.” (This time around, Julie duets the lyric with her Cousin Nettie—a character who would never share that attitude, but Cousin Nettie is Renee Fleming, and hey, we have to give her more to sing. Later, she gets an additional chorus of the slowest “You’ll Never Walk Alone” the universe has ever known.) This is 1873, though that’s been moved up a couple of decades for this production, and this is what Julie would feel, and in softening the sexual politics of the day, we’re being dishonest about the past and avoiding a frank look at how society has evolved in such matters. There’s unnecessary rethinking all over the place. 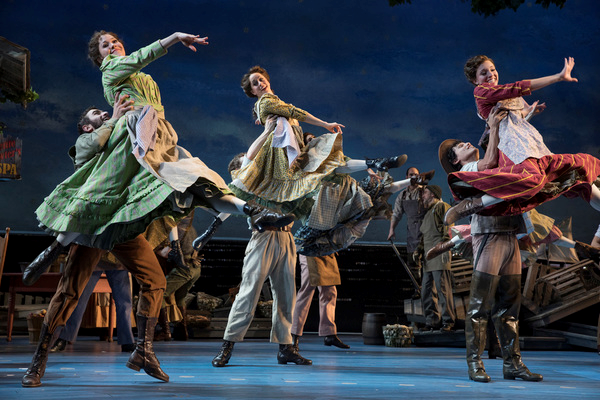 It begins with the opening, Rodgers’ incomparable “Carousel Waltz,” which in 1945 was a mimed prologue detailing Billy’s initial courtship of Julie, which triggers jealous resentment from his employer, Mrs. Mullin (Margaret Colin); the recreational pleasures available in a Maine coastal town during the early Industrial Revolution; and the closeness between Julie and her best friend, Carrie (Lindsay Mendez). Now it starts in Heaven, where the Starkeeper (John Douglas Thompson), assisted by a heavenly corps de ballet, is watching over Billy. And the towns folk aren’t milling around in pantomime, they’re dancing, really dancing, about… who knows what. This is the most choreographed Carousel I’ve ever seen, and it doesn’t help it. Peck’s background is in ballet, as was Agnes de Mille’s, the original choreographer. But de Mille knew when to stop. Peck has dancers constantly leaping and tour jeteing about nothing, and he’s expanded the set pieces, to the point where additional music is required; David Chase’s dance arrangements and Jonathan Tunick’s new orchestrations, fortunately, are quite up to the Don Walker originals. 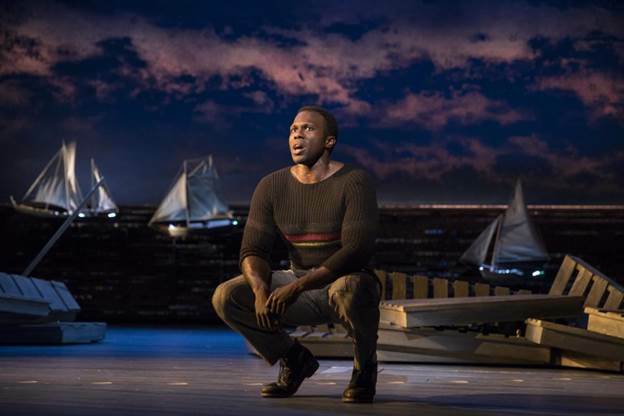 Peck even adds choreographed movement to the “Soliloquy,” Billy’s famous, heartbreaking seven-minute contemplation of impending fatherhood; Henry sings the heck out of it, but what’s all the twirling and arm-waving about? And Peck has turned Jigger Craigin into a ballet dancer. 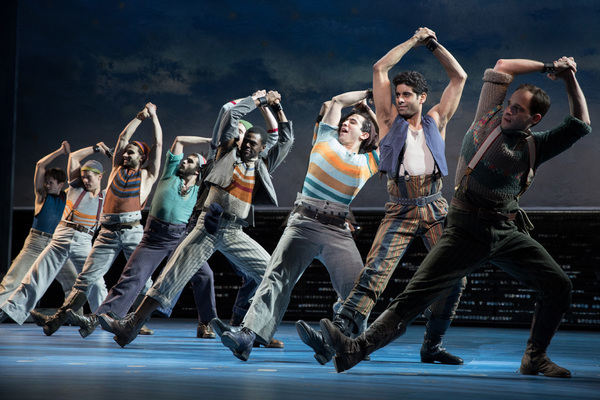 Yes, folks, Billy’s sidekick, a crass, dishonest, and very masculine no-account, now leads the pirouetting in an overconceived reimagining of “Blow High, Blow Low,” Rodgers and Hammerstein’s celebration of the manly life at sea. Amar Ramasar dances it beautifully, but he isn’t Jigger. He’s Megan Fairchild. And oh, the cuts. Act One ends with the “Soliloquy,” not with the townspeople gathering excitedly for the clambake while Billy steals and hides the knife he plans to use in the robbery Jigger has proposed, sending us out into intermission with profound worries about what will happen next. “Geraniums in the Winder,” which gives us a necessary glimpse into the deeply conventional heart of Mr. Snow (Alexander Gemigniani), Carrie’s fiance, is gone. So is “Stonecutters Cut It on Stone,” a welcome diversion just before tragedy strikes, and one of Hammerstein’s sauciest lyrics. A rigged card game between Jigger and Billy just before the robbery, which intensifies Billy’s desperation and helps motivate his suicide, goes missing. It’s still almost a three-hour evening, because there’s so much damn dancing. But much of it feels rushed. Mueller, whose Julie is supposed to be soulful and contemplative, races through her lines. A comic encounter between Carrie and Jigger, which normally would lead into “Stonecutters,” is too hurried to generate any humor. The emotional levels are off, too: Margaret Colin, an actor I’ve admired in the past, scowls, stomps, and shouts her way through Mrs. Mullin to the point where you can’t imagine why Billy would put up with her, meal ticket or not. And special mention must be made of William Youmans’ Mr. Bascombe, the mill owner, a minor role made major through hideous overacting. Henry is vocally secure, and especially impressive on the challenging “The Highest Judge of All,” but emotionally he’s a little limited—an angrier Billy than usual, one whose compensating tenderness and fatherly pride are in short supply. That leaves the acting honors to Mendez and Gemigniani. Her Carrie’s totally delightful, nailing every laugh and accentuating her lower-class roots. Gemigniani gets Snow’s priggishness and capitalist greed just right, and when they duet on “When the Children Are Asleep,” it is temporary musical-comedy bliss. Brittany Pollack’s take on Louise, the daughter for whom Billy returns to earth to try to help, is also excellent, and Peck’s ballet for her sticks comfortingly close to the de Mille original. And Thompson’s a fine Starkeeper, though another O’Brien revision has him wandering among the earthfolk when he isn’t needed. It’s not a huge distraction, but it may confuse those unacquainted with the piece. 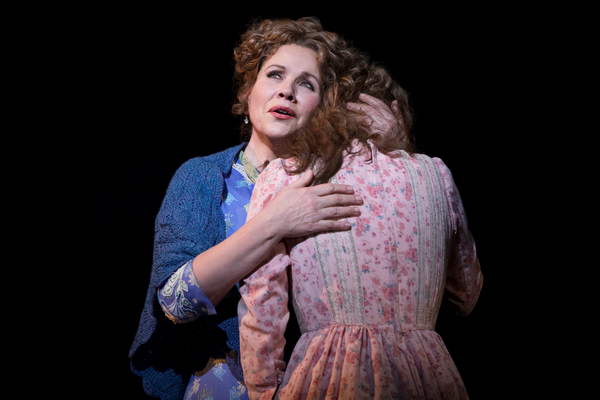 Will this revival earn Carousel new friends? Probably, for the basic material is that good. What’s left of the score remains just stunning, and Hammerstein’s book, even in shreds as it is here, has eternal verities to convey about love, dysfunction, redemption, and the sweet silver song of a lark. But those coming to Carousel for the first time are herewith cautioned: There’s more to it than you’ll find at the Imperial, much more. At the Imperial Theatre, 249 W. 45th St., Manhattan.